Now that Summer has Finally Arrived…. Now that Summer has finally arrived, it is time to spice up the outside areas of your home. 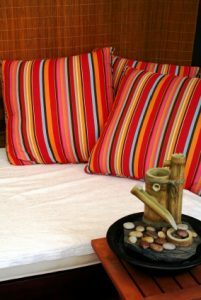 ~Â Bring the flavor of the inside of your home to the patio, backyard and atriums in your home by creating a living space with comfortable furniture, bright colorful Â accents, pillows, rugs, Â and wall art. ~Â Add beautiful flowers and trees Â in coordinating colored pots. Â Always remember the scale of the areas, so large areas can have grand size trees and pots , and smaller areas could have small groupings of different size pots to bring proportion. ~ Donâ€™t forget the Â beauty of lights for those warm evenings. Â Use lamps to reflect your living space style and of course, candles are always a must. Â Important to keep safety in mind, so make sure all lights are compatible to the outdoors and candles are in secure containers. ~ Water features are another way to bring serenity to your outdoor space, whether small table top fountains or grand freestanding fountains , they are a great way to add another dimensions. So have some fun , add some color and enjoy, enjoy , enjoy! !